Posted March 23, 2015 by eventreb & filed under Event Apps, Event Rebels Blog, Meetings Technology, Mobile. Last week, in Vancouver, was TED’s annual conference; aptly themed “Truth and Dare” this year. I read a great article this morning from BizBash called “TED Conference Photos: 18 Steal-Worthy Ideas to Inspire Attendees,” which got me thinking. It’s one thing to steal an idea to use at your conference, but what about stealing an idea from TED that could be used year round? TED does something really well in the mobile world that I’m surprised has not yet been adopted by other conferences. With their TED talks app they share their education year round to inspire their users on the go. 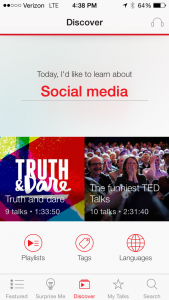 The TED talks app allows you to watch educational talks any time you want. You can choose from featured talks, choose to be surprised, discover different playlists, pick from your own favorites, or search all the TED talks. A frequent topic brought up in discussions about mobile apps for events is “how do we make our apps into a 365 day a year experience?” I think TED has discovered that answer. Wouldn’t it be great to have video rewinds of sessions from our conferences available to watch year round on our mobile devices? Why do we limit the capabilities of our apps to only allow us to connect to each other during a conference or continue communication post-conference, when we could expand the options available and educate our attendees year-round? Here are three potential payment models that could be used if cost is a concern. 1) Subscription model. Make the content available by subscription to your members. Include a 1-year subscription in the cost of attending the conference and make it available for purchase for those who are not in attendance. 2) Get a sponsor. The TED talks app is sponsored by Rolex. It’s not outrageous to think that your sponsors could get a lot of exposure by having their name attached to an app that provides all the members with educational content. 3) A la carte. Have the content available for purchase so that users can pick and choose what content they’d like to pay for. You could even have them purchase playlists based on the theme of the content. So, what are you waiting for? Isn’t it time that your event app become more robust? Take a lesson from TED and take a leap.